Summer always seems to bring some big action blockbusters to the screens. In fact, I kinda love on a rainy summer day or after a day at the pool going to a late night movie. Doesn’t happen too much now that I’m older and a mom, but I love getting to go to the theater and see a good movie. Today’s top ten Tuesday topic fits this really well: “Top Ten Books I’d Love To See As Movies/TV Shows.” There are a ton of books I’d like to see on the big screen and even a few I think would do better on the small screen. As always my list is in no particular order and covers link to Goodreads. Under the Never Sky by Veronica Rossi – By far this is one of my all-time favorite YA dystopians! The series just doesn’t get old. I’ve read it countless times and I’d love to see what Hollywood could do with the series. I’d love to see the red sky and aether storms. Also who would they get for Perry?! 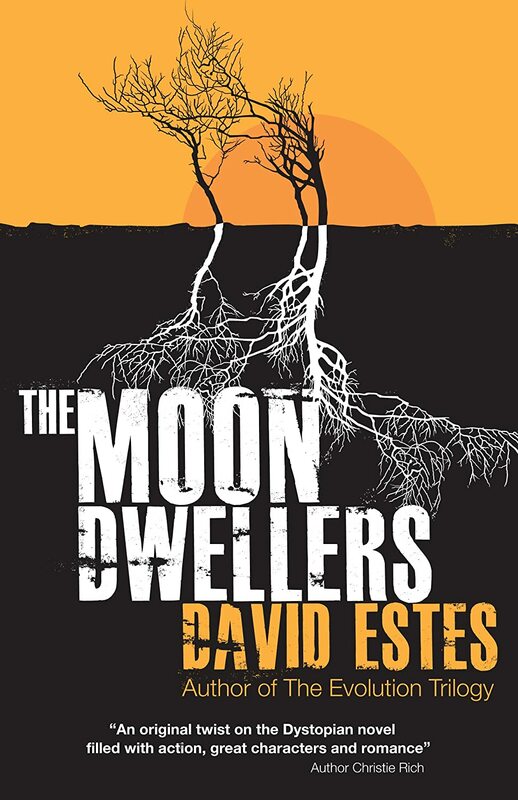 The Moon Dwellers by David Estes – I adore this series! I’m not sure it would do well as a movie series (there are 7 books total) but it would make an awesome TV series. Plus there’s a whole lot of awesome characters from all different walks of life. I’d love to see what it would be like, filming in caves, having an entire civilization underground while the world is struggling above ground. It would just be awesome! Kiss of Fire by Rebecca Ethington – This would be awesome on the big screen! Plus it has 6 books in the entire series 😀 And awesome, amazing characters and an urban fantasy world that I would love to take a peek at 😉 I really just want to see who they would get to play Ilyan and Ryland. The Unearthly by Laura Thalassa – Andre and Gabrielle Enough said 😉 No really….think Harry Potter-esque with a mixture of all supernatural/paranormal creatures. It’s an amazing series so far and I would love to see it played out on the big screen. I mean seriously how cool is a vampire-siren hybrid trying to escape the devil?! By the Numbers Series by Janet Evanovich – Book 22 of this series is coming out in November of this year and I’m just as excited to read it as I have been to read all of these. Now before you say anything, YES the first book was made into a movie, but us fans don’t talk about that. It didn’t do the series justice. Personally because Stephanie, her BFF Lula, and her grandmother are hiliarious, I think this series would be an awesome sitcom and could go a really long time. In fact I see it now, a cross between the Nanny and every law show on TV right now 😉 I know I’d watch it! Shock Me by Ashley C. Harris – Another series that I could see as either a TV show or a movie series 😀 Shock Me is a wonderful YA science fiction series about a group of teens with super powers (think X-men quality). So far the series is awesome and I can’t wait to read more!!! I would love to see it either on the big or small screen. I think it would be fantastic to see some of the stunts that the kids pull off in the books. Broken Aro by Jen Wylie – You know me…I love an epic adventure story and the Broken Ones is definitely that! Aro is one of my favorite female lead characters and each book in this series makes me like her more. This fantasy series is unique and has a fascinating plot that involves humans, elves, fae, and more. It’s full of suspense and a little romance. I’d love to see it on the big screen! What books do you want to see on the big screen? The Stephanie Plum series would make a great television series. Yeah, that movie . . . Not worth mentioning. I would love for the Stephanie Plum series to be turned into a tv show. It would be so funny. I think it would make a great TV show, it didn’t make a good movie though! I would really love to see Under the Never Sky as a movie too! I love that series. It would be exciting to see who they’d cast as Perry! I haven’t read any of these books but I really want to.check out the Unearthly and The moon dwellers they sound awesome. What’s Under The Never Sky about? I love dystopians and am always looking for great new ones to read. Oh JJ UTNS is amazing! It’s set several years into the future (not sure how many) after the Earth’s atmosphere has become unstable. Some of society through a lottery won a place inside these caves and everyone else was left outside. The people who went into the shelters believed that no one survived but hundreds of years later when one of the girls is thrown out she comes across civilization on the outside and learns all about the lies she’s been told. It’s VERY good 😉 Hope you enjoy it if you check it out!